Pregnancies involving twins and other multiples are considered high-risk. Although twins can often be delivered safely, they have a higher likelihood of experiencing birth injuries and subsequent health complications. Twins are at higher risk of a neonatal brain injury called hypoxic-ischemic encephalopathy (HIE), which occurs when there is insufficient oxygenated blood traveling to the baby’s brain during or near the time of birth. HIE can cause lifelong problems such as cerebral palsy, seizure disorders, and developmental delays. In order to prevent HIE and other birth injuries, twins must be closely monitored throughout pregnancy and during labor and delivery. Women expecting twins are often referred to maternal-fetal specialists (MFMs) for specialized care. Hypoxic-ischemic encephalopathy (HIE) is a brain injury caused by insufficient oxygenated blood flow to the baby’s brain (“birth asphyxia”). Problems with the placenta, uterus (womb), and umbilical cord are common causes of birth asphyxia and HIE. Premature babies are more susceptible to HIE and related forms of brain damage (such as periventricular leukomalacia) because their organs are underdeveloped and fragile. Medical professionals should take this into account when managing twin pregnancies, as twins are more likely to be born prematurely. What complications are associated with twin pregnancies? Intrauterine growth restriction (IUGR)/Fetal growth restriction (FGR): The terms IUGR and FGR describe a condition in which an unborn baby’s growth is abnormally slow. Often, this is due to problems with the uterus or placenta (uteroplacental insufficiency). Twins and multiples are at increased risk of IUGR; one major reason is that the babies may be competing for nutrients from the placenta (3). Sometimes, one twin may be affected by selective IUGR due to unequal placental sharing (i.e. one baby gets more oxygen and nutrients than the other) (4). Babies with IUGR typically require early delivery in order to minimize the risk of HIE and other birth injuries (5). Preeclampsia: Preeclampsia occurs in the latter half of pregnancy, and is characterized by the onset of high blood pressure and either protein in the urine or end-organ dysfunction. Preeclampsia can cause pregnant women to experience eclampsia (maternal seizures) and other life-threatening complications. It is also dangerous for the baby because it often results in decreased blood flow in the placenta, and increases the risk of placental abruption and premature delivery. All of these issues can lead to HIE (6). Umbilical cord problems – intertwin cord entanglement: When twins’ cords become entangled, cord compression can occur, which restricts the blood flow going to the babies. Whenever blood flow is restricted, babies are at an increased risk of birth injuries like HIE (7). Twin to twin transfusion syndrome (TTTS) in monochorionic (identical) twins: If the blood vessels of the two babies are abnormally connected, and one baby gets more blood flow than the other from the shared placenta, TTTS may occur. Treatments may include amniocentesis to drain excess fluid or laser surgery to seal off the connection between the blood vessels. Without prompt treatment, HIE and other birth injuries are possible. In severe cases, one or both babies may die (8, 9). Death of one twin: If one twin dies, the surviving twin may be at risk of IUGR, preterm labor, preeclampsia, hypotension, and other problems that can lead to HIE (10). Preterm delivery/premature birth: This is one of the most serious complications of a twin pregnancy. Twins born prematurely are at an increased risk of HIE and numerous other problems (e.g. brain bleeds, infections, and respiratory distress syndrome) due to the immaturity of their organs (11). To confirm the presence of a twin pregnancy. To accurately estimate the twins’ gestational age. This is important in monitoring for IUGR/FGR and in timing planned early deliveries (when necessary). To determine the type of twin pregnancy (e.g. whether the twins are sharing a chorion, amniotic sac, and/or placenta). This can help in assessing risk for complications such as TTTS and umbilical cord entanglement. To assess the health of identical twins’ shared uteroplacental circulation and identify serious pregnancy complications like TTTS. Ultrasounds during the first trimester can also detect abnormalities such as crown-rump length discordance (when one twin is bigger than the other; this is associated with TTTS). Twin pregnancies typically involve more frequent prenatal testing than singleton pregnancies. This may include serial ultrasounds, nonstress tests (NSTs), amniotic fluid tests, and biophysical profiles (BPPs). If complications (such as IUGR) arise, testing will be performed even more frequently. Each twin must be accurately identified. Medical professionals should also document important features like the sites of placental implantation and the sites and types of placental cord insertion (12). More intensive fetal monitoring in the form of Doppler studies is needed if an ultrasound identifies growth discordance or IUGR, or if the mother has anemia (12). Doppler ultrasounds use sound waves to measure the amount and speed of blood flow through the blood vessels. They can be used to check the flow of blood in the umbilical cord and vessels of the uteroplacental circulation. Dichorionic-diamniotic: These twins have their own chorions and amniotic sacs, and generally also have their own placentas. They can be fraternal or identical. Monochorionic-diamniotic: These twins have their own amniotic sacs, but share a chorion and a placenta.They are identical twins. Monochorionic-monoamniotic: These twins share a chorion, an amniotic sac, and a placenta. They are identical twins (13, 14). Typically, there are greater risks associated with monochorionic twin pregnancies, and certain complications (such as twin-twin transfusion syndrome) are unique to monochorionic pregnancies. Therefore, these twins are generally delivered earlier than dichorionic twins (12, 13, 14). Exact recommendations vary, but the American College of Obstetrics and Gynecology (ACOG) suggests that dichorionic-monochorionic twins (in an otherwise uncomplicated pregnancy) be delivered between 34 weeks and 37 weeks + six days (13). Monochorionic twins may need to be delivered even earlier, and via cesarean section, because they are at high risk of umbilical cord entanglement and compression (16). One of the advantages of a scheduled early delivery is having a care team and treatments ready to go if required. Twins may need medical intervention as soon as they are born. These interventions can include resuscitation, cardiovascular support, respiratory support, blood transfusions, and even surgery. In addition, twins at risk of premature birth can be given important medications (steroids, magnesium sulfate) in-utero to help prevent birth injuries and brain damage. However, these must be given shortly before birth to be effective (12). Infection in the baby is also a major risk of spontaneous preterm birth. Preventing premature rupture of the membranes by having a scheduled delivery can decrease babies’ risk of infections like meningitis and sepsis, which can cause permanent brain damage. If doctors recognize signs of fetal distress (such as an abnormal heart rate), emergency delivery will also often be necessary. Should I have a scheduled c-section or labor induction for my twins? Each procedure carries with it attendant risks and advantages (such as uterine hyperstimulation/tachysystole, uterine rupture, umbilical cord prolapse, and infection). Often, medical professionals recommend early scheduled C-sections for twin births, though the timing may vary depending on the mother and baby’s health profiles. Medical professionals should thoroughly explain the risks and benefits of all procedures and medications to mothers in order to obtain informed consent. If one or both of your twins had a birth injury, the first step is to seek appropriate medical care. 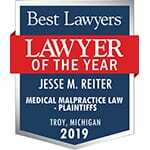 Additionally, if you are concerned that a birth injury stemmed from an error that a medical professional made – whether it was during prenatal care, labor, or delivery – it may be helpful to ask the birth injury attorneys at ABC Law Centers (Reiter & Walsh, P.C.) to review your case. Case review is 100% free and confidential. The money from a birth injury verdict or settlement can be used to secure your child’s future, provide them with therapy and medical equipment, and alleviate the costs of medical care and accessible housing that existing insurance and assistance programs won’t cover.